Dr Jaqui Hughes works as a nephrologist at Royal Darwin Hospital and NHMRC early career research fellow at Menzies School of Health Research. She is a Torres Strait Islander woman who grew up in Darwin before studying medicine at Newcastle University. 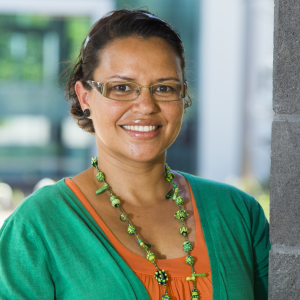 She is a passionate clinician with a keen interest in Indigenous body composition and chronic disease prevention. She completed her PhD examining the body build and composition of Aboriginal and Torres Strait Islander people, and its relationship with obesity and chronic disease including diabetes and chronic kidney disease. She hopes this research will lead to more preventative management by identifying risk factors early and shifting the Indigenous health focus from treating the illness once its happens. She is also involved in collaborative research involving adults with chronic kidney disease (the eGFR Study, ME & Kidney Care study) and who require dialysis (the STARRS project, Perio-CKD Study, WICKD Study, AKI STudy). Dr Hughes is an inspiration to others which was recognised by being awarded the 2012 Northern Territory (NT) Young Tall Poppy Award and the 2013 Top End (NT) NAIDOC Person of the Year. Her clinical-research group was also awarded the 2016 Harry Giese Research into Action Award for “Closing the loop on life-threatening melioidosis infections: observational research informing clinical practice change and policy for adults with severe kidney disease. She is also the co-convenor of Australia and New Zealand Dialysis and Transplantation Registry (ANZDATA) Indigenous Working Group (2014-), an Expert Advisor for Indigenous Renal Disease, The Primary Care Education Advisory Committee for Kidney Health Australia (PEAK)(2014-), and former member of RACP Aboriginal and Torres Strait Islander Health Advisory Group (2008-2013).